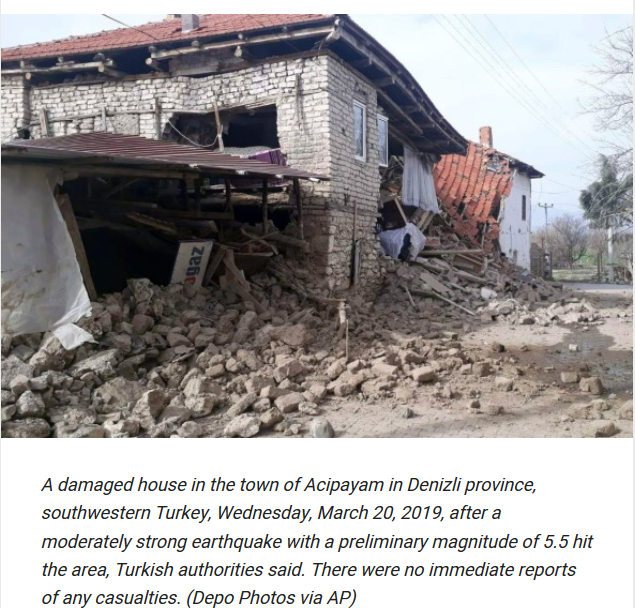 A 5.5-magnitude earthquake hit Turkey’s southwest on March 20, authorities said. 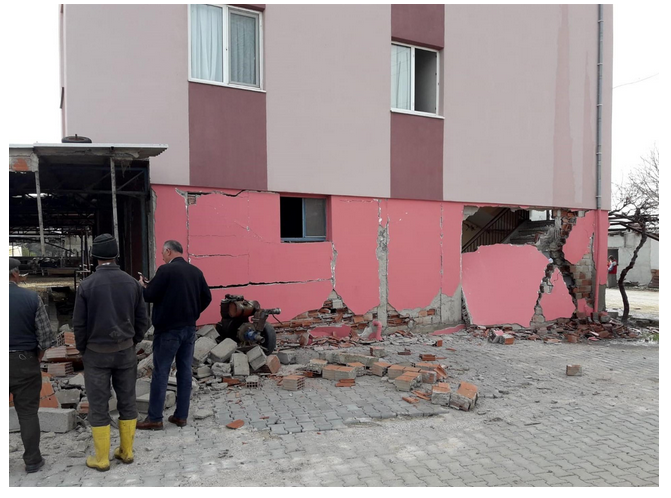 The quake damaged some 50 buildings and knocked bricks and tiles to the ground in the Yeniköy, Karahöyük, Uçarı, and Gedikli neighborhoods, said officials, warning citizens not to enter damaged structures. AFAD President Mehmet Güllüoğlu similarly said that three citizens were “slightly injured.” “We have not received so far any information about any loss of life,” he said. Apart from the 5.5-magnitude quake, 31 aftershocks between the magnitudes of 2.1 and 4.8 hit the province early on March 20. Ali Şanlıer, Acıpayam district governor, said that the schools in the Acıpayam district were closed for the day, whereas patients receiving treatment at Acıpayam State Hospital were taken outside the building due to panic. Meanwhile, the president of the Turkish Red Crescent (“Kızılay” in Turkish), Kerem Kınık, said their organization had sent teams to Denizli following the quake. “Additionally, from the Aegean region, in a lorry, 20 tents of 16 square meters, two sunshade tents of 50 meters square, one sunshade tent of 63 meters square, 250 blankets, 100 beds, one light tower, one generator have been dispatched to Denizli,” Kınık said on his Twitter account. “I saw some roof tiles, bricks and solar water heaters fell from the roofs. There are some cracks in buildings. I did not see any building collapse. Everyone is outside,” he said. “I saw some chimneys broken and roof tiles falling on the streets. Some garden walls collapsed as well. Everyone is scared and outside. No one is injured,” another resident told reporters.